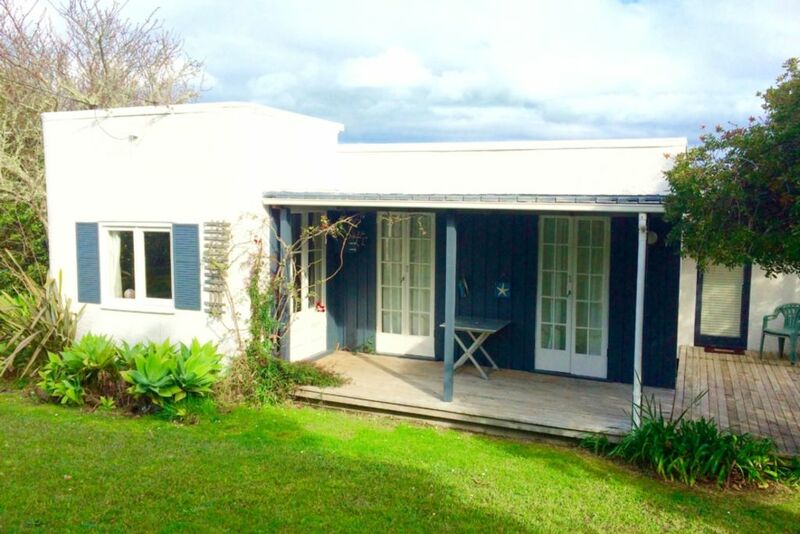 All day sun and sea views, from this lovely art deco cottage, in Oneroa. Deco Cottage is situated within a 5 minute walk to 3 amazing beaches with swimming, boating and fishing. Just a few minutes walk to the main village of Oneroa featuring a great variety of shops, for all your holiday needs, restaurants, deli, cafes and bars. Deco Cottage is a wonderful year round retreat. All bedrooms have their own french doors to the sunny front deck while all living areas have wonderful sea views opening on to the back deck. The property has a large lawned outside area, off-street parking, outdoor furniture and a gas BBQ. The cottage retains its Deco charm while being very comfortably furnished, and includes TV, DVD, stereo, fully equipped kitchen including microwave, fridge-freezer and appliances. A washing machine and drier are accessible for 7 night minimum stays. All bedding is supplied; guests just need to provide towels. A portacot, bath and high chair are available for those with young families Prices include linen. Tea, coffee and basic supplies are available on arrival. Transport from the wharf is a 5 minute ride by taxi or bus. Deco Cottage is a perfect base from which to explore the world class wineries, amazing walks, beaches and charming village of Oneroa, on this amazing Hauraki Gulf Island. During the winter months stay for 3 nights and the 4th night is included free of charge. Please enquire about great long term rates for a week or longer. In summer a discount will apply for stays of 7 nights or more. from when we arrived, all was provided for. finding the key, getting inside,switching on the hot water,viewing the whare was GREAT. we loved the little 'bits n pieces' that we found (milk,tomato sauce,lots sleeping spaces,towels, drawers). Pleasant outlook. Older style Bach. Good value clean and tidy. Excellent and clear communication from owner. Lovely stay - was just what the doctor ordered! Lovely location, cute property, nice and close to shops, cafes, and beach. The location was ideal. Close to Oneroa and a good base for many of the great walks Waiheke has to offer, & fabulous beaches. The cottage’s orientation meant it caught any breezes and windows and doors could be opened & closed to regulate the temperature no matter how hot the day.